Preparing for the PMP exam is an arduous task. However like any other project you come across, it is made of sectional parts that can be processed individually. One of the big areas of study to focus on when prepping for the exam is the 10 PMP knowledge areas. Come exam time and knowing these 10 areas and how they apply to the five PMP process groups and 47 processes will be a huge benefit. The knowledge areas, process groups and processes work together to form the foundation for Project Management Methodologies. These are organized in the PMP Knowledge Areas Mapping Matrix: Found in table 3.1 of the PMBOK Fifth Edition. The processes involved in this knowledge area is all about “coordination and cooperation”. Integration combines all of the needs, expectations and project plans for all involved and creates one cohesive document. Managing changes to the project also falls into integration. This knowledge area defines “what is included and what is not” in any given project, giving clear boundaries and statement of work. Scope gives clear parameters to all members of the project team. This knowledge area involves “developing a realistic timeline for the project and the activities needed to complete the project”. Each deliverable, department and activity has a unique timetable so that the project can proceed on a reasonable schedule. For most clients, this is a very important step in a project. This is to ensure that a “project is delivered within budget”, is a trait of a successful Project Manager. The processes in this knowledge area involve establishing a budget and estimating costs for labour and equipment etc. Controlling costs is an ongoing process in every project. Delivering a project is not enough. You are required to ensure that it “functions according to expectations and has been thoroughly tested”. Quality Assurance (QA) is an important process of this knowledge area and involves weighing the finished product against the features, performance and values promised at the start of the project. Each and every project requires a TEAM. This knowledge area involves “identifying, developing and managing the human element of the project”. 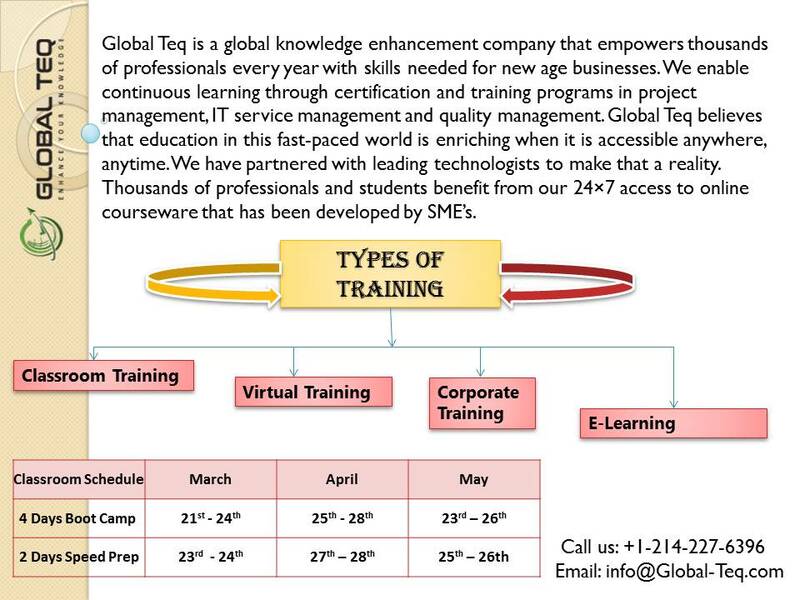 Making sure that your human resources are being utilized effectively and have the right skills to contribute to the project. Through every step in the project, you have to be able to “manage communications internally and externally” with the project stakeholders, different departments and manage reporting. Clear and concise communication ensures that everyone is on the same page. 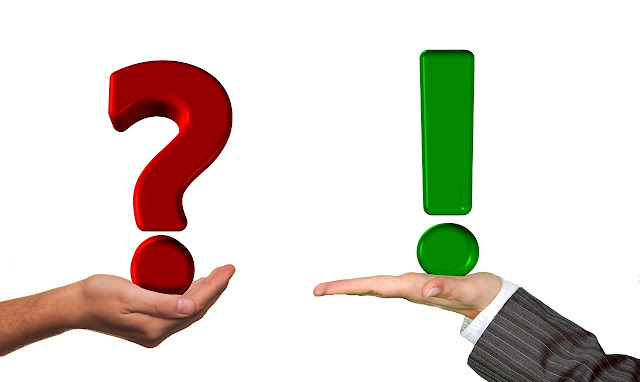 Identifying risks means “identifying uncertainties”, both threats and opportunities that can occur during a project. Collaborating/communicating with as many people as possible means that you will have a broader and more thorough understanding of uncertainties that can occur and plan responses to contest them. This knowledge area identifies “resources that will be required outside of the project team in order to complete deliverables: contractors, freelancers, vendors and suppliers etc”. These are the “decision makers”. The project stakeholders are the people within the project who have the power to create change and whose involvement or non-involvement can have negative or positive influence on the completion of the project. Stakeholders also tend to have authority by allocating resources like time, money or expertise to the project. 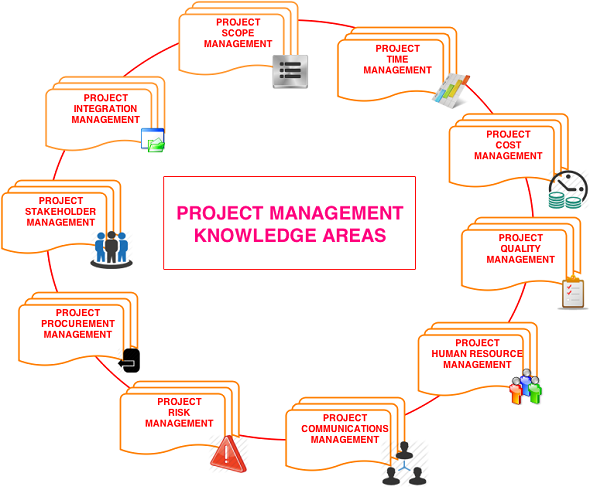 Every Project Manager must have full command of these 10 PMP knowledge areas which are important ideas when undertaking any/every project. The Knowledge mapping matrix can help you visualize just how necessary these interactions are throughout the process. The knowledge areas work interdependently with the process groups and processes to complete the project lifecycle and understanding how they work together will increase your chances of passing the PMP Certification exam. What are the various challenges faced as a Business Analyst? A Business Analyst has to be an interface between the users and the technical team and provide regular support. Let’s take a look at some of the major challenges which a Business Analyst faces…. • There are several software methodologies, technologies, documentation standards in the market and they keep on evolving. A Business Analyst has to be on top of such methodologies and trends to be successful in this profile. • A Business Analyst is regarded as a knowledge house when it comes to domain knowledge and has to keep on updating himself/herself with the industry and company know-how to keep equilibrium. • Since they lay the foundation of the project, there should be clarity regarding the requirements. In case of any gaps, there could be huge repercussions. 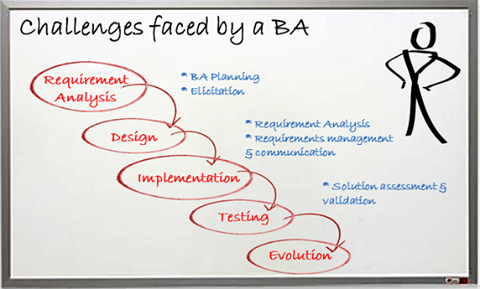 Challenges faced by a Business Analyst @ requirement gathering…. • The Business Analyst could not get requirement because of lack of knowledge among stakeholders. • Few of the stakeholders are in a comfortable position and don’t want any change. • Some stakeholders may not want to lose their prominence. • Conflict of Ideas among the stakeholders.